VOGONS • View topic - Faulty Voodoo 2? One of the cards seems to work fine. The are both detected in Device Manager. If I remove the faulty one, the other one works fine. I've inspected the card and as far as I can see there are no damaged components, the legs on the chips all appear to be straight and not shorted. I've cleaned the PCI contacts and blown dust off the card with compressed air. Any other ideas or is the card basically rubbish? Try to disable texturing and see if glide apps start. First of all, you need clean system with MS-DOS. Pentium 1 or 2 class machine is ideal. Pentium III, 4 and later PC is a bad choice for diagnoses purpose. Do not use any type of overclocking your system, run it with default CPU, Memory and BUS clocks. PCI = 33 MHz. Secondly, you need download 3dfx Glide2 SDK for DOS/Win32 V2.43 and unpack gwebvgr3.exe. Then change dir to /Glide/Diags/DOS and find diagnose utility MOJO.EXE . Run it with clean MS-DOS enviropment and analyze results. 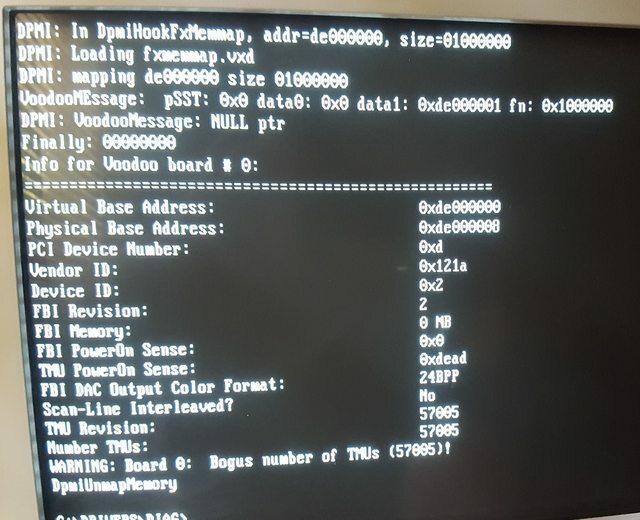 However I put in my working Voodoo 2 and seem to get the same output on screen and in the log file? Could it be a faulty DRAM chip? Did the same diagnostics as well and no errors in the log files. Donut King, i have similar issue (same errors). Did you solve It?